Back in the 1990s I was lucky to be able to research, in some depth, the alchemical material in the Ferguson Collection in Glasgow University Library. 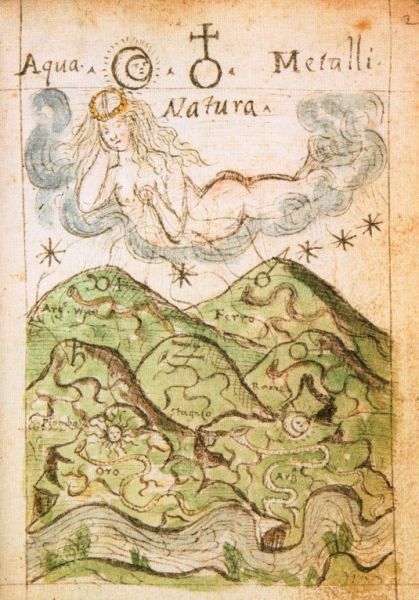 Among the many items there I remember the alchemical notebook of Antonio Neri (1576-1614), the author of the famous treatise on glass (Arte vetraria). One of his notebooks on alchemy from 1598/99 has survived which has many recipes and remarks on alchemy and a wealth of pen drawn coloured illustrations - there are about 60 spread throughout the text. One of these has recently come to my attention. It shows the seven hills of the planetary metals with streams or perhaps veins, leading down to a river in the foreground. High in the sky we see the figure of Nature, flying in a cloud. She squeezes her breast and expels seven stream of her milk which become the veins of the metals in the earth.